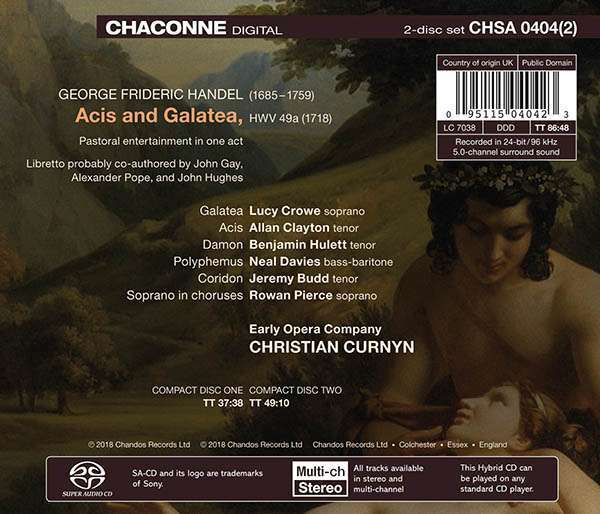 Der Artikel Georg Friedrich Händel (1685-1759): Acis and Galatea HWV 49a (1718) wurde in den Warenkorb gelegt. Die Masque Acis and Galatea war zwar Händels erstes dramatisches Werk in englischer Sprache, dennoch gelang dem Komponisten hier ein kleines Meisterwerk, das sich durch eine äusserst lebendige und differenzierte Charakterisierung der mythologischen Figuren auszeichnet. Zum 300. Jahrestag der Uraufführung hat die Early Opera Company unter Christian Curnyn dieses bezaubernde Werk mit einer exzellenten Sängerbesetzung eingespielt. Hörprobe Track 2: Chor: Oh, the pleasure of the plants! Chor: Oh, the pleasure of the plants! Hörprobe Track 4: Air, Galatea: Hush, ye pretty warbling choir! Air, Galatea: Hush, ye pretty warbling choir! Hörprobe Track 6: Rezitativ, Damon: Stay, shepherd, stay! Rezitativ, Damon: Stay, shepherd, stay! Hörprobe Track 7: Air, Damon: Shepherd, what art thou pursuing? Air, Damon: Shepherd, what art thou pursuing? Hörprobe Track 8: Rezitativ: Acis: Lo, here my love, turn Galatea, hither turn thy eyes! Rezitativ: Acis: Lo, here my love, turn Galatea, hither turn thy eyes! Hörprobe Track 2: Rezitativ mit Begleitung, Polyphemus: I rage - I melt - I burn! Rezitativ mit Begleitung, Polyphemus: I rage - I melt - I burn! Hörprobe Track 4: Rezitativ, Polyphemus: Whither, fairest, art thou running. Rezitativ, Polyphemus: Whither, fairest, art thou running. Hörprobe Track 5: Air, Polyphemus. Cease to beauty to be suing. Air, Polyphemus. Cease to beauty to be suing. Hörprobe Track 6: Air, Coridon: Would you gain the tender creature. Air, Coridon: Would you gain the tender creature. Hörprobe Track 8: Air, Acis: Love sounds th' alarm. Air, Acis: Love sounds th' alarm. Hörprobe Track 9: Air, Damon: Consider, fond shepherd. Air, Damon: Consider, fond shepherd. Hörprobe Track 11: Trio, Acis and Galatea: The flocks shall leave the mountains. Trio, Acis and Galatea: The flocks shall leave the mountains. Hörprobe Track 12: Rezitativ mit Begleitung, Acis: Help, Galatea! Help, ye parent gods! Rezitativ mit Begleitung, Acis: Help, Galatea! Help, ye parent gods! Hörprobe Track 13: Chor: Mourn, all ye muses! Weep, all ye swains! Chor: Mourn, all ye muses! Weep, all ye swains! Hörprobe Track 14: Solo und Chor, Galatea: Must I my Acis still bemoan. 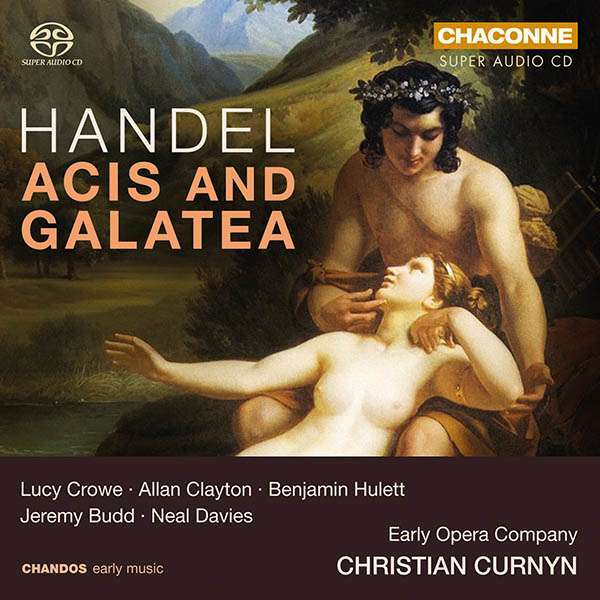 Solo und Chor, Galatea: Must I my Acis still bemoan.